119 records – page 1 of 3. 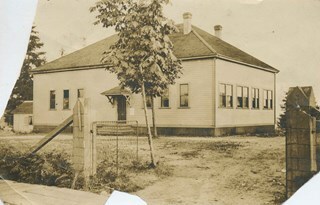 Photograph of the exterior of Burnaby's first Municipal Hall located at 7252 Kingsway and Edmonds Street. 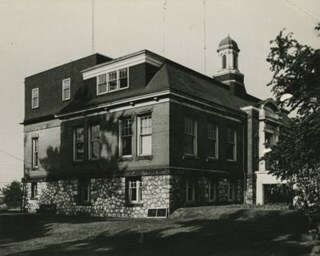 Photograph of the Municipal Hall grounds and building at Kingsway and Edmonds Street. This was the second Municipal Hall. 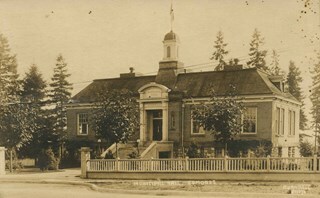 Photographic postcard of the exterior of Burnaby's Municipal Hall at Edmonds Street and Kingsway. This was the second Municipal Hall built. 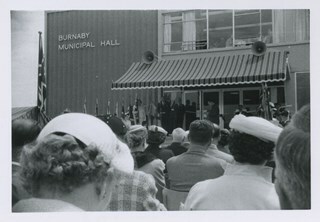 Annotation at bottom of photograph reads, "Municipal Hall, Edmonds / Hurndall Photo"
Photograph of the dedication of Burnaby's Honour Roll at Burnaby Municipal Hall, Edmonds and Kingsway. 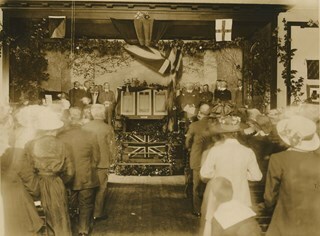 A crowd is gathered inside the hall looking toward a decorated stage on which is the honour roll and group of men. Annotation on back of copy 7 reads, "1919 - Dedication of Honour Roll / War of 1914-18 / in old Mun. 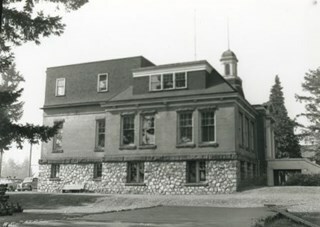 Hall (now Library)"
Photograph of the exterior of the Municipal Hall at Kingsway and Edmonds Street. This was the second Municipal Hall built. A sign over the door read, "Municipal Hall / Burnaby." 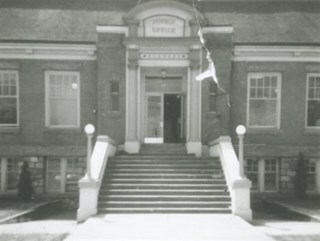 Photograph of the exterior of Municipal Hall at Kingsway and Edmonds Street. A sign above the door reads, "Municipal Hall / Burnaby." The First World War memorial fountain, dedicated to Municipal employees who died in the War, can be seen on the left. In 1974, this memorial was relocated from its original setting to the site of the Burnaby Village Museum on Deer Lake Avenue. 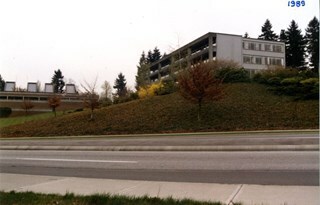 Photograph of the exterior of Burnaby Municipal Hall at Kingsway and Edmonds Street. 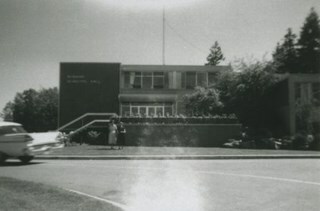 Photograph of the exterior of Burnaby Municipal Hall at 4949 Canada Way. 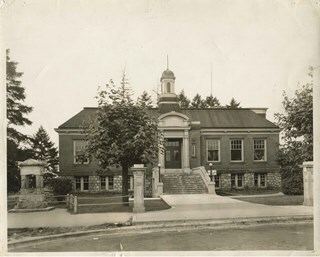 Photograph of the second Burnaby Municipal Hall and the New Municipal Hall in the background on the left. 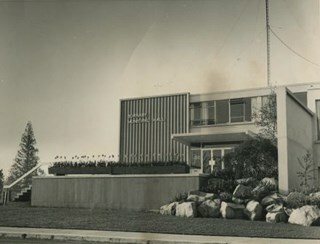 Photograph of Burnaby Municipal Hall, 7282 Kingsway at Edmonds Street. This was the second Municipal Hall building. 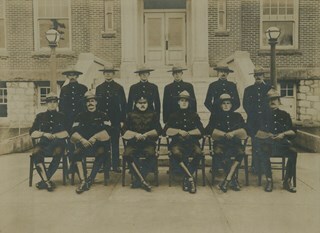 Photograph of the Burnaby Mounted Police in dress uniform, complete with gauntlets and English riding boots. The officers are seated and standing in two rows in front of the Burnaby Municipal Hall at Kingsway and Edmonds. Standing in the back row are; E.N. Senior, A.W. James, Peter Kelsberg, George Jeffery, W.F. Nicholson. Seated in the front row are; R.L. Doidge, Sergeant J.H. Lynne, Chief William Parkinson, R. Kenderson, R.J. Woolens, and D.S. Wright. Photograph of the Municipal Staff standing and sitting on the steps of the Municipal Hall. 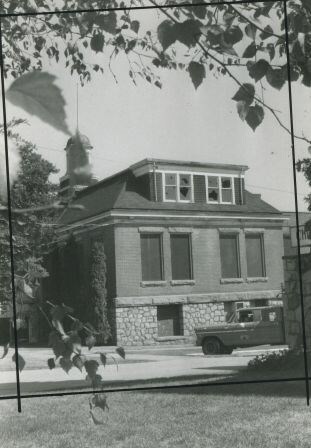 Photograph of the exterior of the police office in the Municipal Hall at Edmonds Street and Kingsway. 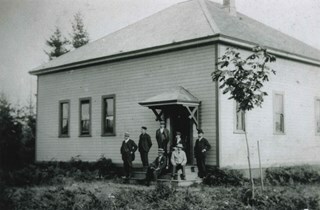 Photograph of council members and others sitting and standing on the steps of Burnaby's first Municipal Hall. Photograph of a small corner of the exterior of the second Municipal Hall, located at Kingsway and Edmonds. 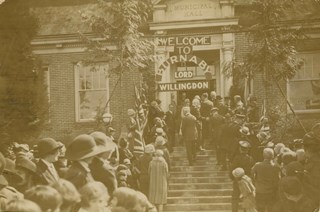 Photograph of the First World War Honour Roll dedication at the former Municipal Hall at Edmonds and Kingsway. The intention of this memorial was to "keep the record bright before the people of the municipality". At the conclusion of this war over 1,200 names of service men and women were listed including over 90 "Heroic Dead" who paid the "ultimate sacrifice". 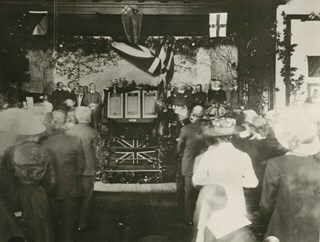 Photograph of the former Municipal Hall during the visit of George VI and Queen Elizabeth. Located at Kingsway, just east of Edmonds Street. Photograph of a large crowd gathered outside the Municipal Hall on Kingsway. This photograph was taken during the visit of King George VI and Queen Elizabeth in 1939. A large group of spectators can be seen standing on either side of the street. 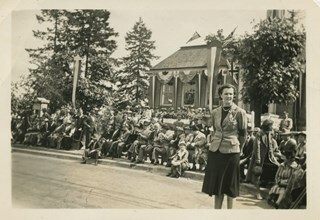 Photograph of a crowd gathered outside the Municipal Hall for Princess Margaret's visit. 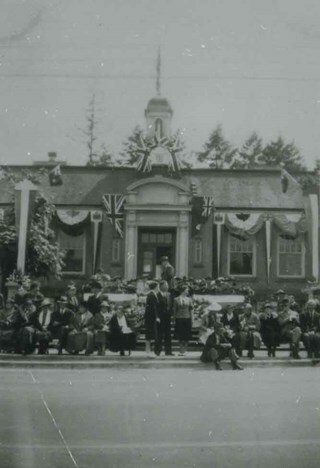 Photograph of Lord Willingdon and Civic Officials standing on the steps of Burnaby Municipal Hall. A sign above the door reads, "Burnaby / Lord Willingdon." 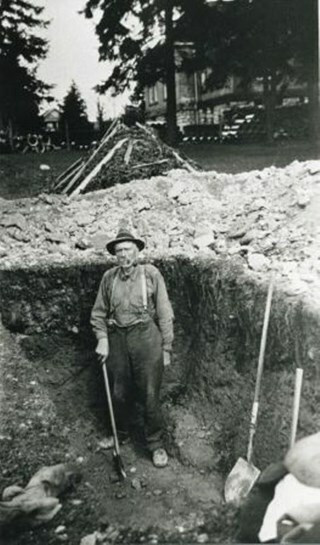 Annotation on lower right corner reads, "Lloyd Studio, McKay, BC / 14"
Photograph of a man identified as George Pearson digging a foundation with a pick and shovel at the Burnaby Municipal Hall site at Kingsway and Edmonds Street. Note the Municipal Hall in the background. 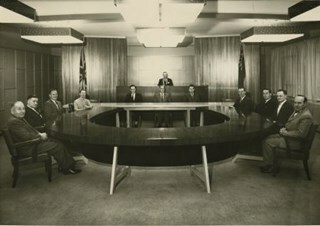 Photograph of the Burnaby Council in chambers. 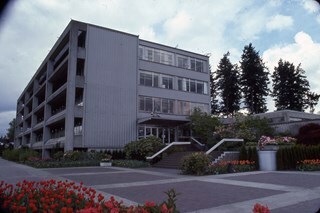 Photograph of an exterior side of the Burnaby Municipal Hall. A parked police car is visible in the parking lot at the back of the Hall. This was the second Municipal Hall built. 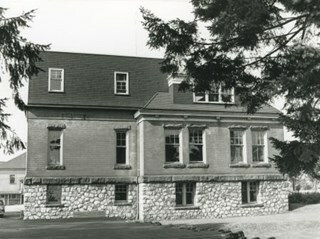 Photograph of the exterior side and back of the Burnaby Municipal Hall. Parked cars are visible in the parking lot at the back of the Hall, and piles of large pipes and wooden 2" x 4"s are both visible along the side. This was the second Municipal Hall built. 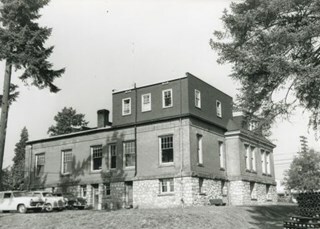 Photograph of the exterior side and back of the Burnaby Municipal Hall. Parked cars are visible in the parking lot at the back of the Hall, and piles of large pipes are visible along the side. This was the second Municipal Hall built. 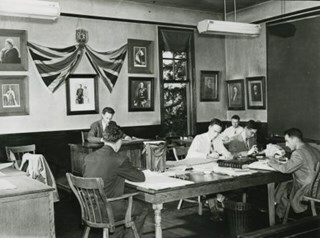 Photograph of "STAFF USING COUNCIL CHAMBER" at the second Burnaby Municipal Hall. 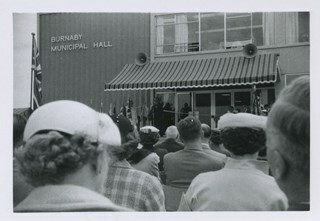 Photograph of the "OVER-CROWDED GENERAL OFFICE" inside the second Burnaby Municipal Hall. Photograph of "BUILDING FATIGUE" inside the second Burnaby Municipal Hall. 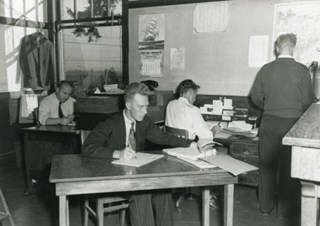 Photograph of secretaries working inside the second Burnaby Municipal Hall. Plan filing room. Fire hazard??? 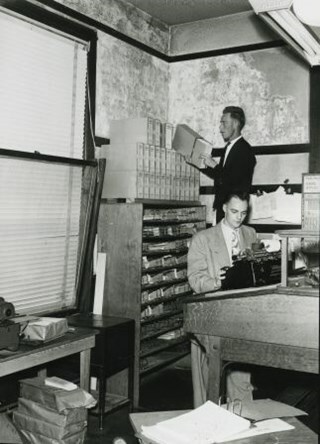 Photograph of the "PLAN FILING ROOM [believed to be a] FIRE HAZZARD [sic]???" inside the second Burnaby Municipal Hall. 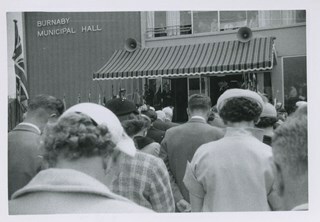 Photograph of two women standing outside of the Burnaby Municipal Hall on Canada Way. The woman on the left may be Betty Stevenson. 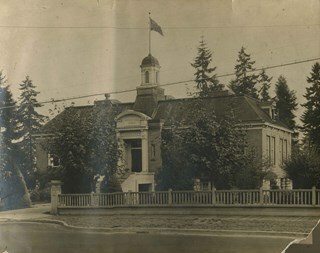 Photograph of the old Municipal Hall building at Kingsway and Edmonds. 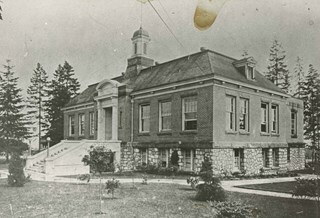 This building was constructed in 1911 and used as the Municipal Hall until 1956, at which time the new Hall was built at the current location (4949 Canada Way). 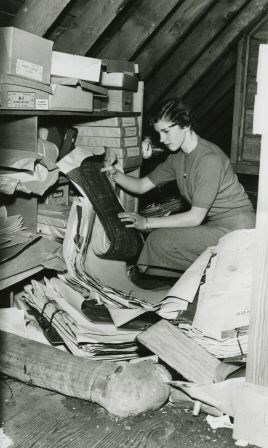 Photographs in this collection were taken and compiled by Norah Code, former editor of the "Burnaby Courier" newspaper during the course of her work for the newspaper. 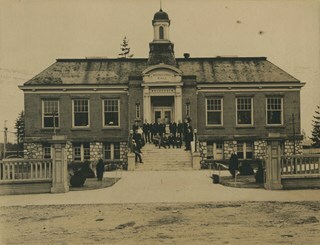 Photograph of the exterior of Burnaby's third Municipal Hall. 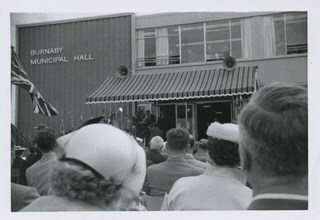 This hall was opened in 1956 on Grandview Highway (later, Canada Way) and it replaced the old hall at Kingsway and Edmonds Street. 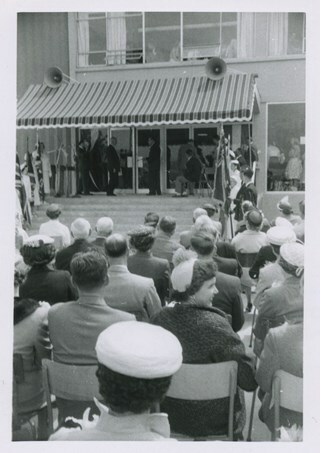 Photograph of a large crowd of people gathered outside Burnaby Municipal Hall for the dedication of the War Memorial Fountain, which is now located in the Burnaby Village Museum site. To the left of the photograph, located on the lawn of the Municipal Hall, is the memorial fountain, with a wreath hanging on the top. inscribed in the original negative, and printed on the photograph, l.r. "Stride Photo"
Photograph of the War Memorial Fountain located on the lawn of Burnaby Municipal Hall, during its dedication ceremony. There is a large crowd of people gathered around the fountain, with boys in scout uniforms standing to the right of the fountain, and ladies and RCMP officers standing to the left side of the fountain. There is a man standing next to the fountain, blowing on a trumpet. There is a wreath hanging from the top of the fountain, which bears the inscription, "OF OUR FELLOW WORKERS WHO FELL IN THE WAR/ 1914-1918/ ERECTED BY/ THE CIVIC EMPLOYEES UNION - BURNABY - 1923" The War Memorial Fountain is now located in the Burnaby Village Museum site. 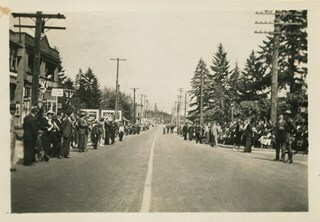 Photograph of a large crowd gathered outside the Municipal Hall on Kingsway. This photograph was taken during the visit of King George VI and Queen Elizabeth in 1939. 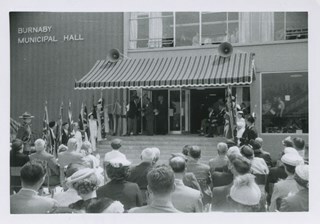 A large group of spectators stand on either side of the street and the Burnaby Municipal Hall has been adorned with Union Jacks and decorations. The woman standing in the foreground, to the right has been identified as Gladys Almond. Note on verso reads: "Gladys Almond / Kingsway - 1935"
Photograph of a group of 24 men and women wearing various uniforms standing on the steps of Burnaby Municipal Hall holding Union Jacks. 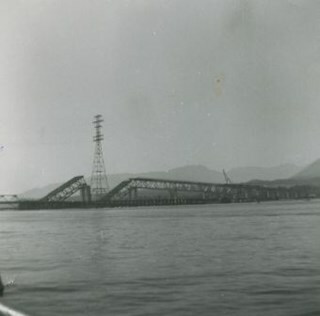 The photograph was taken on the occasion of the 1951 Royal Visit. None of the people in the photograph are identified. 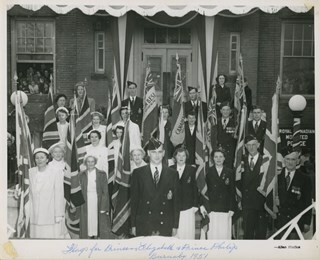 Caption on recto reads: "Flags for Princess Elizabeth & Prince Philip / Burnaby 1951"
Photograph of a crowd of people gathered on the steps of Burnaby Municipal Hall as part of the welcome reception for Lord and Lady Willingdon. 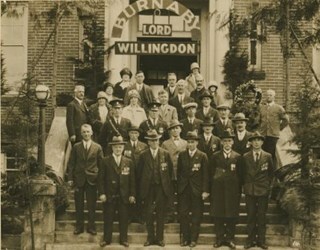 They visited Burnaby in 1928 while Lord Willingdon was touring Canada in his role as Governor-General. A sing hanging over the door reads: Welcome to Burnaby Lord Willingdon. 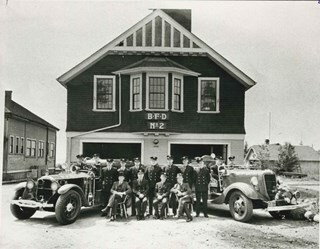 Photograph of Burnaby fire department trucks and firefighters, in front of fire hall No. 2. 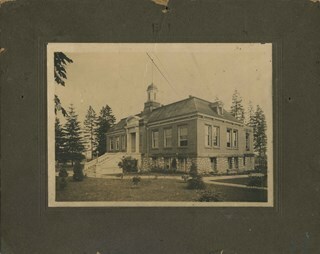 Note the old Burnaby Municipal Hall on the left. File consists of photographs of the exterior of Municipal Hall, including the overhead walkway and Justice building. 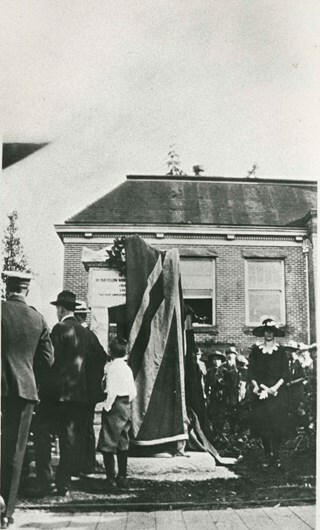 Note in blue ink on exterior of case slides originally housed in read: "1985 May / Burnaby Arts Ctre May Flowers"
Photograph of Constable George Jeffery (left) during the unveiling the First World War memorial fountain at the Municipal Hall, Kingsway and Edmonds Street, on June 17, 1923. It was dedicated to Municipal employees who died in the War. At the right is Dora Wilcox, daughter of Ernest Wilcox who was killed on the Somme in 1916. She unveiled the fountain. 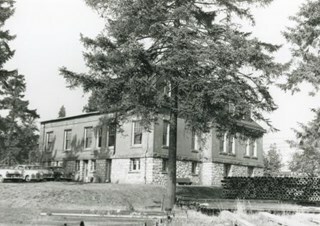 In 1974, this memorial was relocated from its original setting to the site of the Burnaby Village Museum on Deer Lake Avenue. Photograph of Lord Willingdon, the Governor General of Canada shaking hands with a soldier on the steps of the Burnaby Municipal Hall as many spectators look on. 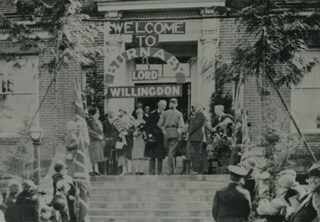 A large sign above the steps to the Hall reads: "WELCOME TO BURNABY LORD WILLINGDON".